I’m not at the Tokyo motor show today but I wish I was, if only to poke at two cheeky urban commuter cars very obviously inspired by Renault’s innovative Twizy city EV. 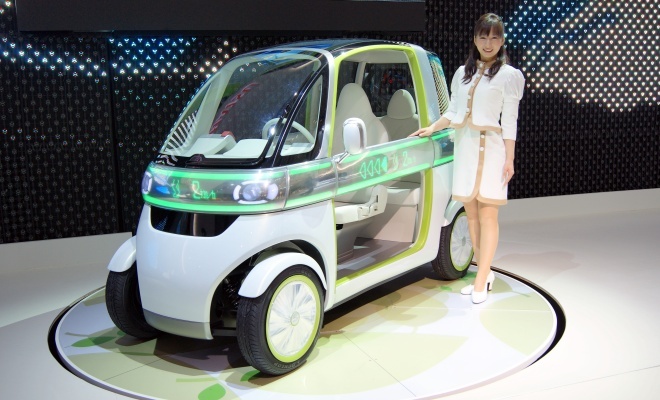 Daihatsu’s Pico looks a lot like someone has taken a set-square to Renault’s angular design. The Pico is remarkably upright and sober in demeanour, despite splashes of lurid lime green and the playful animated graphics running around a beltline information strip. It does look as though the Pico’s upright stance has allowed some reasonable room for a rear-seat passenger. I’ve folded myself into the back of a Twizy and it feels unpleasantly like being sandwiched into a Tupperware box. The Pico’s rear perch looks to be a lot more airy, roomy and pleasant. 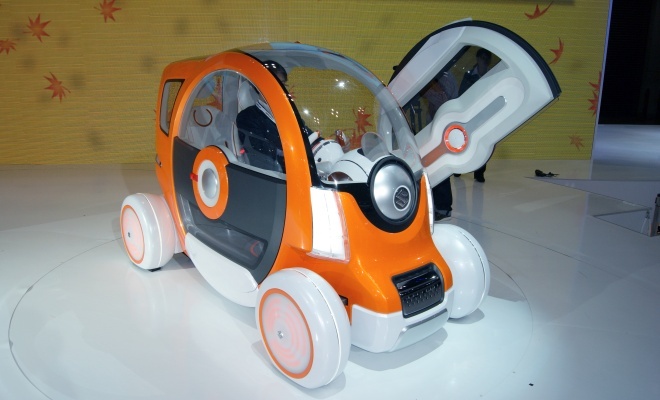 Like the Twizy, the Pico is permanently open to the elements, with a pair of vestigial safety bars in place of doors. The bars do lift in Lamborghini scissor style, but nobody is going to mistake this little EV for a sports car. Dramatic scissor doors also feature on the Suzuki Q, but they fade into everyday ordinariness in the face of the Q’s overall orangeness and circularity. Unlike the Twizy and Pico, the Q does try to keep out the rain. The side windows evidently open with an unusual circular action, the glass rotating around a central pivot to spin away into the lower half of the door. I don’t have technical details of either yet, but I assume both the Q and Pico are rear-drive battery electric vehicles, just like the Twizy. Renault’s alliance partner Nissan is also pressing ahead with its prosaically named New Mobility Concept, which rather than aping the Twizy is actually just a Twizy with Nissan badges. It would be easy to assume that the Pico is a near-production product while the Q is a designer’s flight of fancy, but it may be that neither will be made real. At the Tokyo show, Nissan product chief Andy Palmer talked about the difficulty of bringing innovative products to market in Japan and many other countries. Renault will sell the Twizy in Europe under rules governing quadricycles – a legal category falling between motorcycles and cars, which allows light vehicles to sidestep many of the expensive safety measures demanded of full-sized passenger cars. Few territories outside Europe recognise the concept, so Nissan has begun lobbying governments – presumably starting with Japan and the US – to highlight the real and growing need for this kind of vehicle in our choked urban environments.